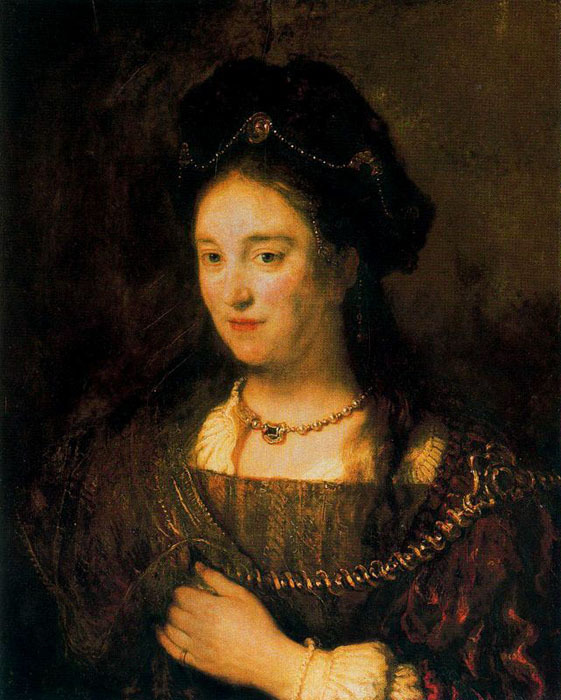 Rembrandt's first portrait commissions came from Amsterdam. In comparison with his previous self-portraits and studies of heads, the first commissioned works from the year 1631 reveal a new approach. 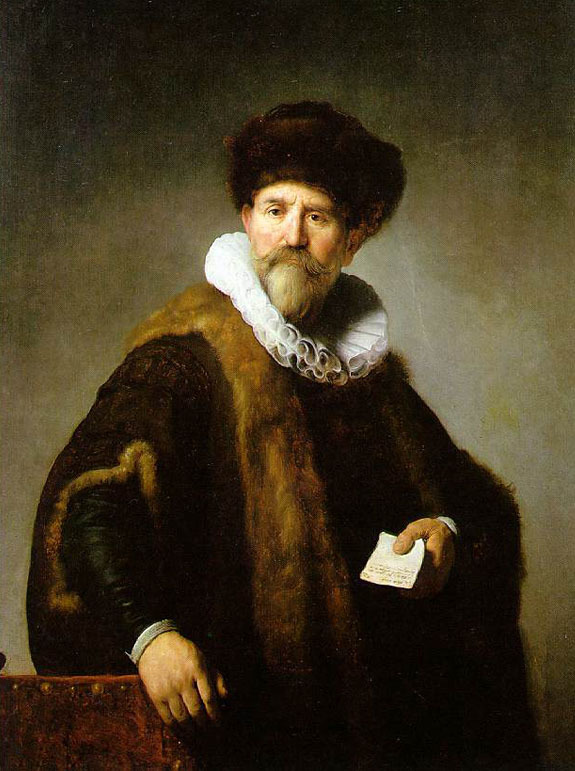 The Amsterdam Merchant Nicolaes Ruts is depicted in fine clothes, with shimmering dark material, soft fur on gown and cap, and a translucent ruff. Everything is finished off down to the last detail. The man holding a note in his hand is quite consciously presenting himself to the observer. Like the numerous portraits that were to follow, A Man Sharpening a Quill demonstrates a high degree of exquisiteness and perfection in its execution. 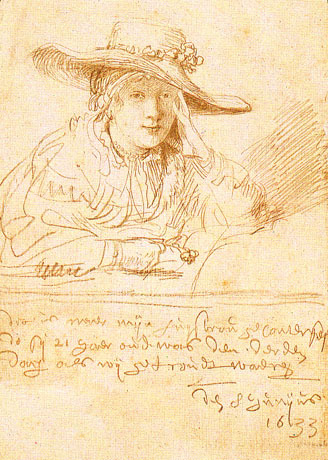 However, the posture no longer corresponds simply to the pose for a portrait, as was the case with Nicolaes Ruts; although his eyes are turned towards the observer, the manner in which he is sharpening his quill suggests that he has merely briefly interrupted his writing and, sunk in thought, is momentarily looking to the front. All the indications are that these portraits were extremely concise, accurate and true-to-life representations. Indeed, it was this depictional perfection that was to bring the young artist an increasing number of commissions of an ever more prominent nature. 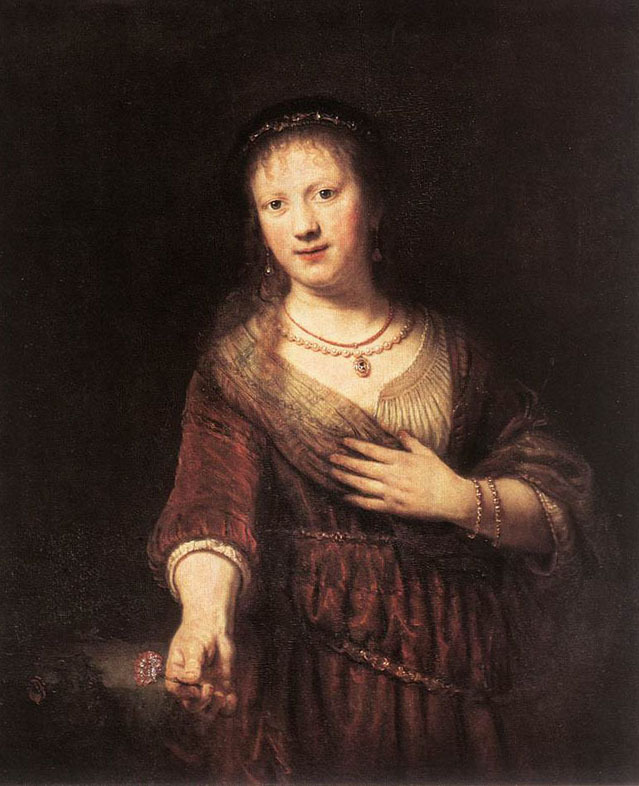 The extent to which Rembrandt's art of portraiture was held in awe may be seen in a couplet by Constantijn Huygens on the portrait of Jacob de Gheyn: "This is Rembrandt's hand and de Gheyn's face. Be amazed, o reader - it is de Gheyn, and yet it is not." Capturing the presence of the person portrayed by means of the appearance of the portrait - this was the ideal which the acknowledged young artist fulfilled in the up-and-coming metropolis. The painter had attained a degree of perfection that could hardly be improved upon. Here, too, the limits of art - such as had hitherto been valid - would seem to have been reached. 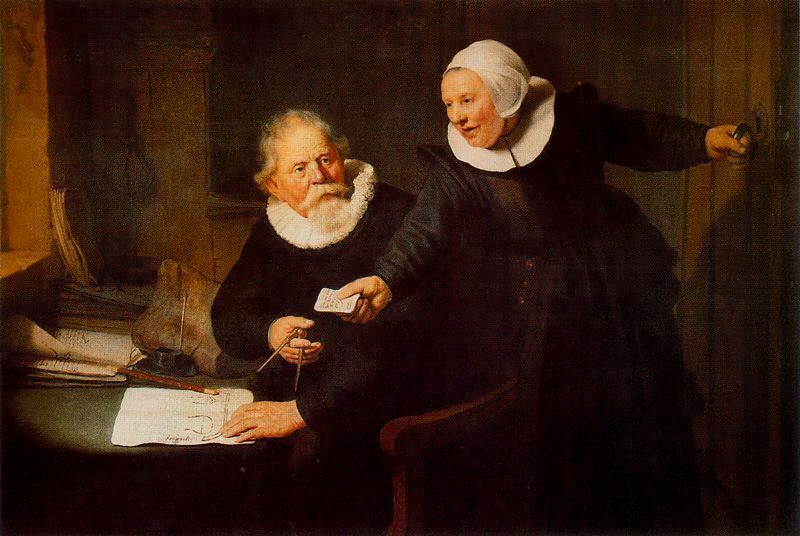 Rembrandt, however, was not content with merely fulfilling the expectations of his clients. After only a few works, he was to abandon the customarily accepted forms of presentation and turn to structuring his portraits as he had previously his scenes. 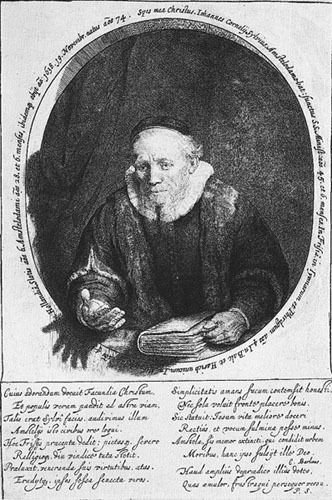 He presents Jan Cornelisz. Sylvius, the pastor, preaching out of the frame of the picture as if from his pulpit. The Bible, in which Sylvius has placed his finger to mark the place of a quotation, and his declaiming hand project beyond the surrounding oval, as do the shadows that they cast. The baroque motif of illusion suggests the lifting of the barrier between the pictorial world and that inhabited by the observer, a barrier which would otherwise be defined by the frame. The vivid effect created by the double portraits of this time stems from their depicting the people portrayed in situations characteristic of their work. It was only a short time after starting work in Amsterdam that Rembrandt was awarded the prestigious commission from Nicolaes Tulp, Prelector of the Guild of Surgeons, to execute a group portrait (Doctor Nicolaes Tulp Demonstrating the Anatomy of the Arm). Public anatomical lectures had become customary, and were intended — as is no longer the case today - to demonstrate the wisdom of the Creator in His construction of the human body. The most important thing when performing a dissection was that what was revealed should not challenge but rather uphold this wisdom, as it had been preserved in the books of the great philosophers. It was not until the beginning of the 17th century that interest in anatomy was fully aroused. Every insight into the structure of the body was a sensation, and the lectures found a wide public. Vesalius, the famous surgeon, had been the first to dissect the muscles and tendons of the hand, and Nicolaes Tulp, the "Amsterdam Vesalius", was held in great esteem. Rembrandt breaks with traditional form in his very first group portrait, depicting the persons involved not in a row next to each other but collected around the body, the tendons of the right forearm of which are exposed. As an aid to the lecture that he is delivering, the surgeon is lifting some tendons with his forceps. In imposing contrast to the other figures, Tulp is seated on an armchair and is also the only one wearing a large hat. His audience of seven respected Guild members is listening to the lecture, and the different character of each person's behaviour is vividly portrayed. Rembrandt lets their expressions speak. 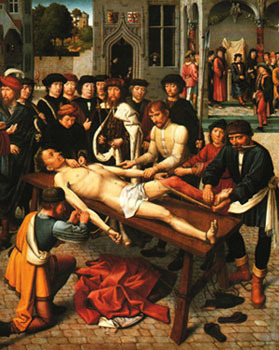 He shows the looks of concentration directed at the speaker, the sceptically expert inspection of the dissection, the manner in which it is followed in and compared with the book lying open in the right foreground - but also the distracted look so typical of people who are listening intently, the unfocussed gaze of a person concentrating upon what he is hearing. In taking part in the doctor's address, each of the figures is participating in a collective action. There is a further dimension which also comes into play here. The typical behaviour at a lecture includes the exchange of glances with another listener with whom one is familiar, an exchange expressing or requesting agreement with what has been said. It is in this way that the look of the doctor whose head towers above those of all the others, directed forwards out of the scene in the picture, may be understood - as an exchange of glances with the observer, who thereby sees himself challenged to participate in the actions of those involved in the depicted incident, to join them in listening and looking. Indeed, he sees possible ways of behaviour spread out in the picture in front of him, in the spectrum of different gestures and facial expressions; in observing the lecturer, in looking at the body, the book or the other figures, he is for his part performing the same actions as the protagonists in the picture. In this way, he can put himself in the position of the audience of experts. In his "Introduction to Anatomy" Leonardo da Vinci wrote that he had "dissected more than ten human bodies, dismembering every other part and removing every tiny piece of flesh surrounding the arteries without spilling more than a few drops of blood from one or two capillary veins... And even if you are interested in such matters, you may well be deterred by a feeling of disgust; and should this not repulse you, you still might be disturbed by fear of spending your nights in the company of horribly flayed and mutilated corpses; and if this prospect does not put you off, you may yet have failed to acquire the proficiency in drawing which is necessary for such studies..."
Leonardo was by no means the first artist to study pathological anatomy in order to perfect his ability to depict the human body. His teacher Andrea Verrocchio, and Andrea Mantegna, painter to the Mantuan court, had both experimented in this field. Century-old church prohibitions against the dissection of human corpses had gradually relaxed during the last decades of the quattrocento. Various tentative postmortem examinations had been carried out in the Middle Ages, too - by Mondino de Luzzi (c. 1275-1326) at Bologna (1306), for example. A textbook based on his examinations had somehow managed to escape prohibition for over two centuries. However, Pope Boniface VIII had forbidden, under penalty of excommunication, all further experiments involving the dismembering or boiling down of human corpses. Leonardo's words, cited above, reveal the sense of novelty, disgust and horror which accompanied the first breaches of this prohibition to be undertaken in the spirit of "curiositas", or scientific curiosity. For even teachers of medicine at the universities had avoided all contact with human corpses. 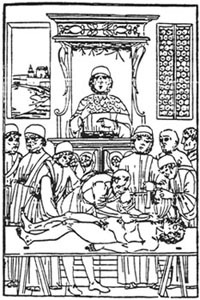 In the late fifteenth century Italian woodcuts had depicted professors of medicine removed from their listeners behind raised lecterns, as they delivered abstract lectures based on anatomical knowledge derived solely from Classical sources like Hippocrates, Galen or Dioscurides, while beneath them, surgical assistants dissected real corpses. This did not change until the sixteenth century. One of the most important testimonies to new developments in anthropotomy, or human anatomy, is the work, based almost entirely on his own observations, of the Netherlandish anatomist Andreas Vesalius ("De corporis humani fabrica", 1543). This work also expressed its author's theological views, for Vesalius saw the human body as a "product of divine handiwork". One interesting aspect of the woodcuts (possibly by Jan Stephan van Calcar) which accompanied the book is the way in which the corpses, depicted to illustrate various systems of arteries, tendons, muscles and bones etc., seem paradoxically vital, moving and behaving as if they were living beings, indeed even reflecting - in a manner possibly also illustating the artist's macabre sense of humour - on the transience of all earthly life. 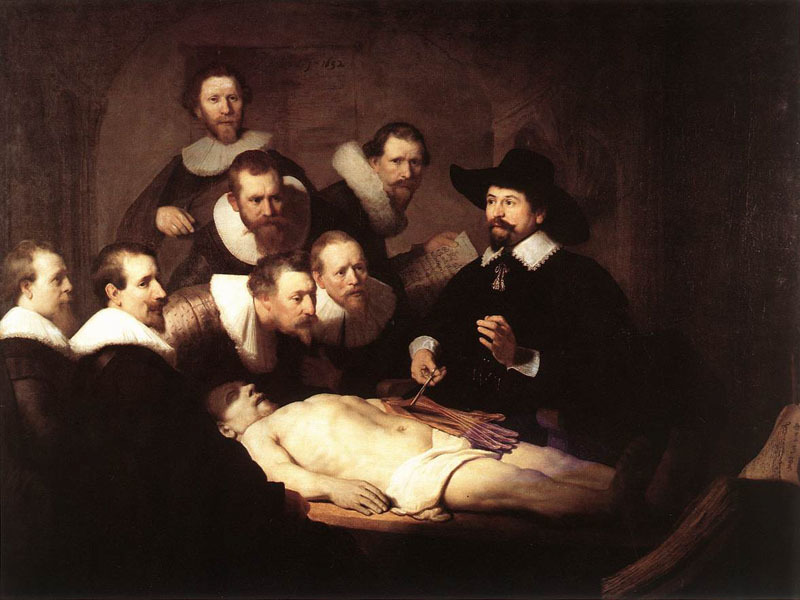 Rembrandt's famous painting The Anatomy Lesson of Dr. Nicolaes Tulp (1632), an example of a type of group portrait cultivated particularly by Netherlandish artists, shows the changing relationship of medical science to the human corpse in the early days of empiricism. A more secular view of death is apparent here in the matter-of-fact attitude towards the corpse demonstrated by the professor and his students. The professor, the only figure shown wearing a hat, has exposed to view the tendons and muscles of the left arm. The corpse - dissections were usually performed on the bodies of executed criminals - lies almost diagonally across the picture space. The listeners, some portrayed in profile, others "en face", are grouped around the dead man's head. They are bending over to compare the empirical data with an open textbook, placed rather inconspicuously in the shadows at the foot of the bed. 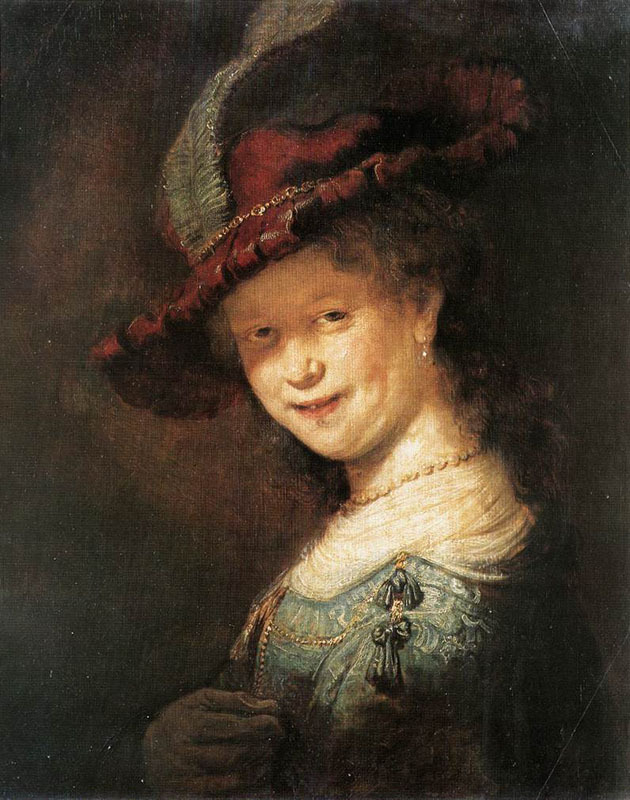 "Rembrandt met his sitters' demands to portray each one of them individually. He also enabled his main subject, an anatomy lesson, to be seen for the first time in its own right." The truth of this statement can only be fully appreciated by comparing Rembrandt's painting with the earliest known painting of an anatomy lesson, executed by Aert Pietersz in 1603, in which the 28 members of the Amsterdam Surgeons' Guild, together with their lecturer, are shown standing in three paratactic rows. The arrangement reveals their desire to be portrayed as separately from one another as possible. The effect is partly to conceal the corpse, making the assembled company look as if it has been engaged in some form of clandestine pursuit. Attention has too rarely been called to the fact that Rembrandt's composition builds on an earlier type of painting, developed by Gerard David to depict the course of justice when the corrupt Judge Sisamnes was flayed alive at the behest of King Cambyses (The Flaying of the Corrupt Judge Sisamnes). The humorous parallel suggested here by Rembrandt - between an executioner's assistant flaying someone alive and a professor of anatomy dissecting a corpse - may have introduced a latent element of criticism in the painting. 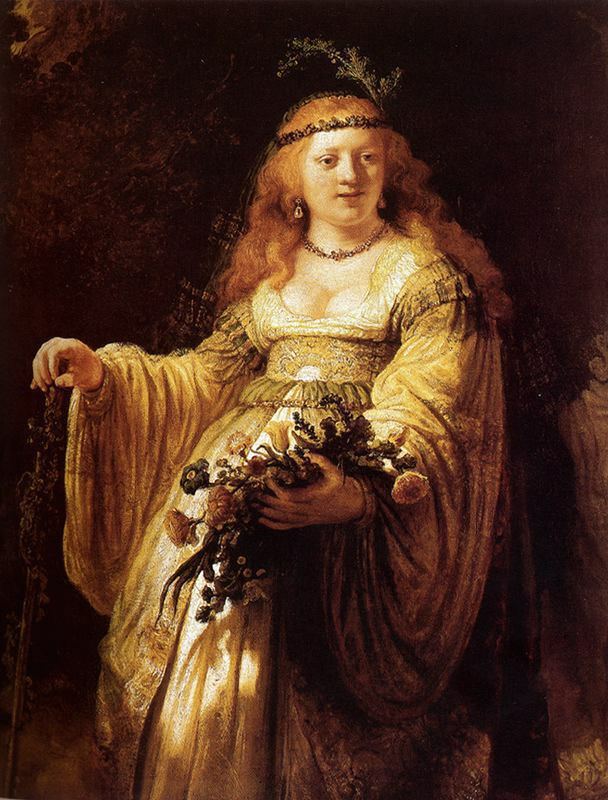 The appropriate sense of sobriety brought by Rembrandt to this painting does not seem to have precluded his imbuing it with an equally apparent emotional depth. 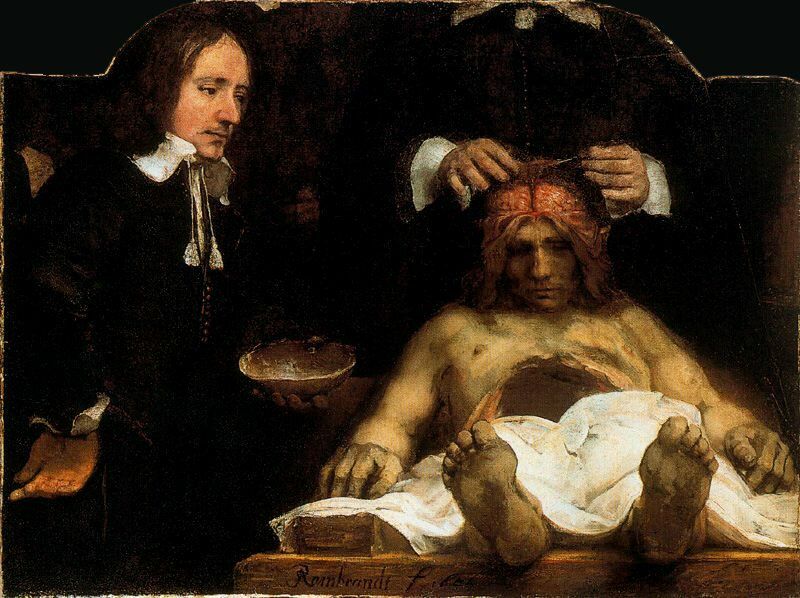 This is confirmed in a second - albeit fragmentary - "anatomy lesson", presided over by a Dr. Joan Deyman (The Anatomy Class of Dr. Joan Deyman) and executed in 1656. A preliminary study in bistre and ink (now in the Rijksprentenkabinett, Amsterdam) shows that the painting, which was largely destroyed by fire in 1723, was composed symmetrically. Small groups of figures are shown standing to the left and right. Behind the corpse - which belonged to a certain Joris Fontein, condemned to death for robbery on 27 January 1656 - is the lecturer, whose hands, holding a scalpel, are all that now remain of him. The top of the skull has been lifted off to reveal the cerebral hemispheres. When viewed from a distance, the scalp, peeled off and hanging down at either side of the head, resembles long, flowing hair, so that the frontal view of the dead man's face recalls certain renderings of Christ. 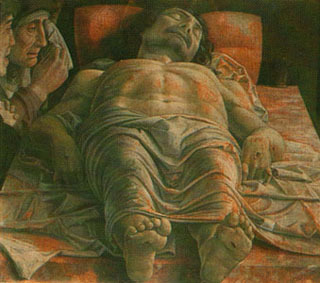 Indeed the compositional arrangement of the dead body, with its feet stretched out towards the spectator, closely follows that of Mantegna's Christo in scurto (c. 1480), one of the most impressive devotional paintings of the early Renaissance. 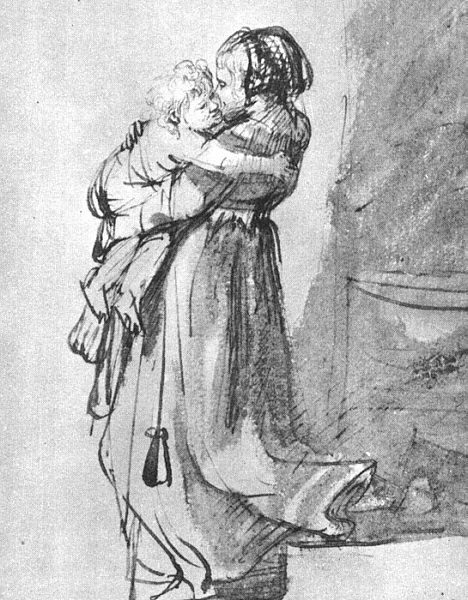 The formal parallel here implies that the dead man in Rembrandt's painting, who has been outlawed by society, and whose mortal remains have been denied all sanctuary and due respect, is redeemed in Christ's words: "Inasmuch as ye have done it unto one of the least of these my brethren, ye have done it unto me" (Matth. 25, 40). 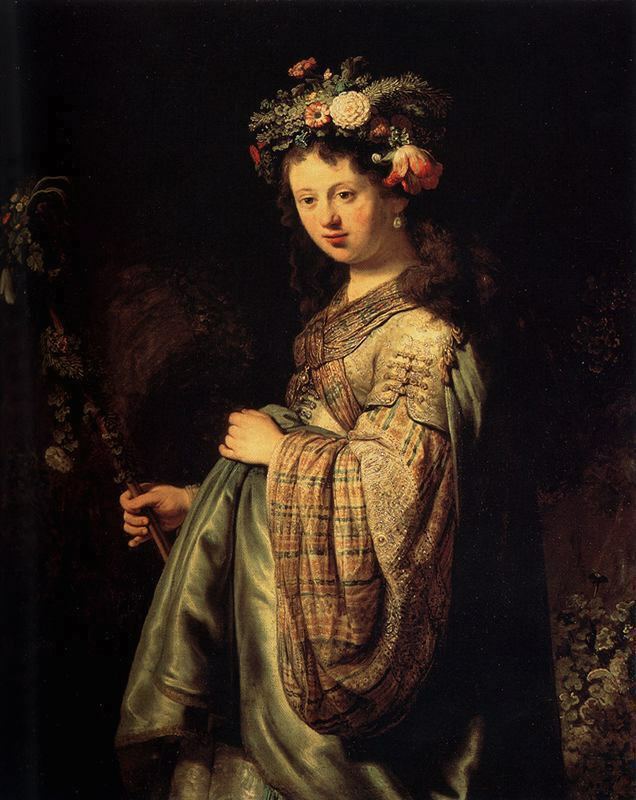 Spirituality, and, by extension in Rembrandt's painting, social pathos, had played an increasingly important role in the artist's work during the 1650s. The subject of the painting may even have been a deliberate reference to the biblical passage cited above. 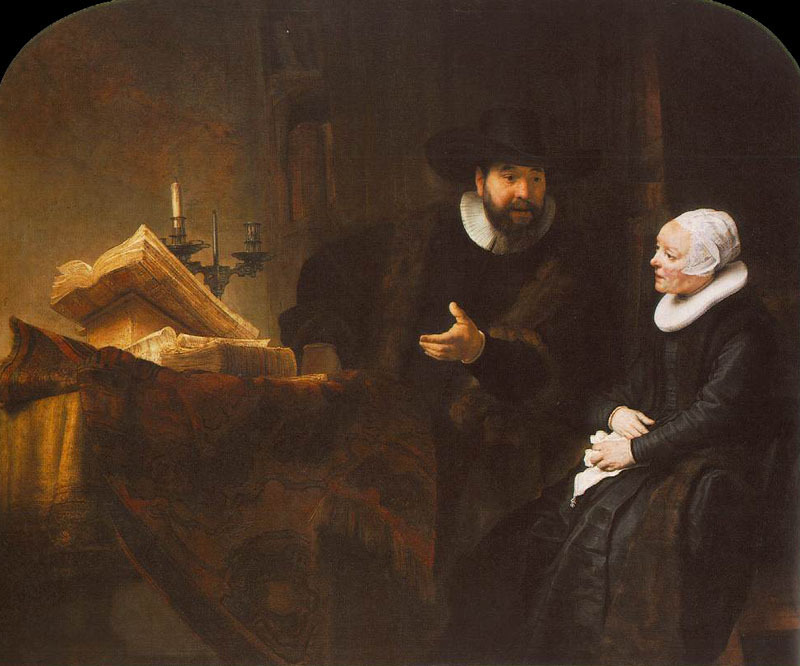 If we assume that Rembrandt's painting represented a particularly good likeness of those being portrayed, and if we also assume that the work hung in the Guild's convening chamber, then the scene must have created an almost amazingly true-to-life impression upon contemporary viewers. It is noteworthy what deep respect came Rembrandt's way as a result of the representational realism of precisely this scene. 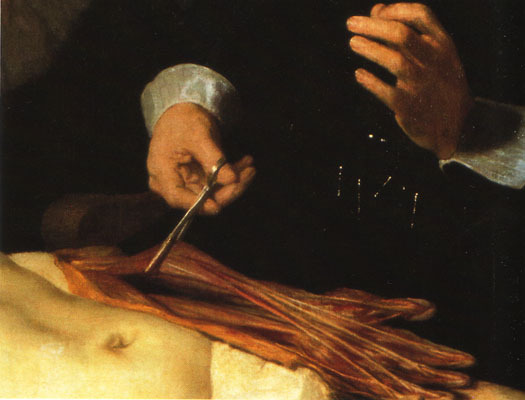 For the body — that of an executed criminal known to us by name - is also realistically depicted, and the representation of the dissected arm corresponds to the state of knowledge at the time. Rembrandt's estate even included plaster casts of arms which had been dissected by Vesalius. The development of the individuals notwithstanding, it should be noted that the behaviour of the persons is for the most part typical of such a situation, and that the individual features are also more emphatically delineated than is really necessary for the situation. As a result, it is true to say that the individual qualities of expression become all the clearer. 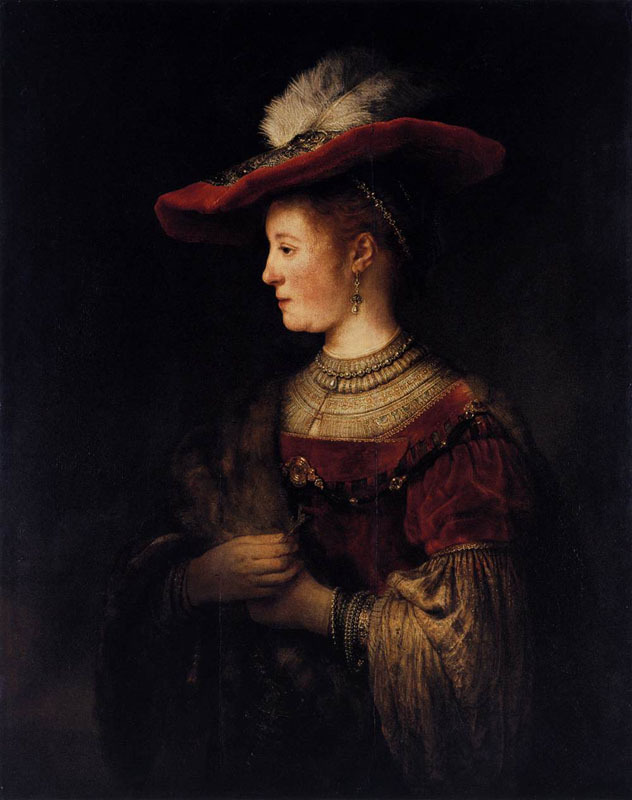 However, this heightening betrays to today's eyes a tendency towards pose, one which Rembrandt was only to overcome later - albeit then completely. Despite this, the representational fascination of this picture was so great at the time - and continues to be so today -that it was hardly noticed how unrealistic the whole scene is in comparison with a situation in reality. The figures have been placed so closely together that it is impossible to ascertain who is standing, who sitting, and where. Moreover, their proximity to each other is such as to grant them no room in which to move. Nor does the element of perspective aid us in fixing their position in the depicted surroundings. While it is true that the depicted room does not create a narrow impression, it is still taken up almost entirely by the bodies of the figures. Most of these figures are depicted as if seen from a point somewhat below them — yet from where could such a perspective be obtained? The arrangement also leaves unclear where the observer - who is otherwise included to such a great extent in the action - should see himself in relation to the scene in the picture. The dense nature of the action is of course emphasized by the manner in which the figures have been moved so close together; nonetheless, the realism of the action is achieved at the expense of the remaining depicted reality. The plausibility of the action's coherence conceals the implausibility of the spatial situation. It is the action which unites the figures, and not the setting - for the setting is ultimately not the lecture theatre portrayed in the picture, but the picture alone. In spite of everything, however, it is the uniting of the eight half-length portraits to form a group, representing a fitting manner of depiction in the view of the Guild members, that asserts itself as the principal reason for the portrayal. 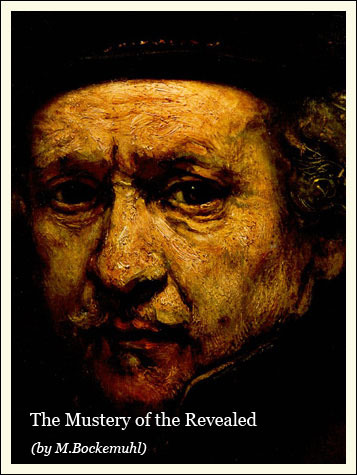 This attitude also explains why Rembrandt's circle of clients became ever smaller as his portraits gradually ceased to be a representative end in itself, finally focussing entirely upon their action — in the encounter between observer and subject. 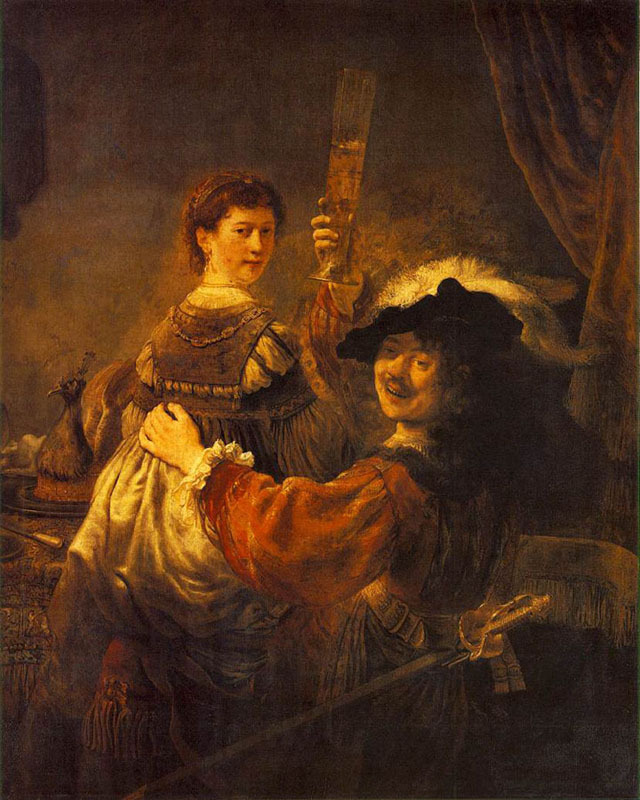 There are other ways in which Rembrandt connects a portrait with the course of events in a happening. Occasionally, he will assign the subject of the portrait a role within a "history painting". The young artist, meanwhile already a member of the Amsterdam Guild of St. Luke, aiming at the highpoint of his career and, two years later, defending himself with a slander action against the accusation that his wife was senselessly squandering her dowry, presents himself dressed in velvet, brocade and silk, with rapier, feathered hat and raised glass, and with Saskia on his lap, as The Prodigal Son in the Tavern. He had already depicted his mother in one of his early works in the role of the prophetess Hannah; towards the end of his life, he was to paint his son Titus and his daughter-in-law as Isaac and Rebecca. 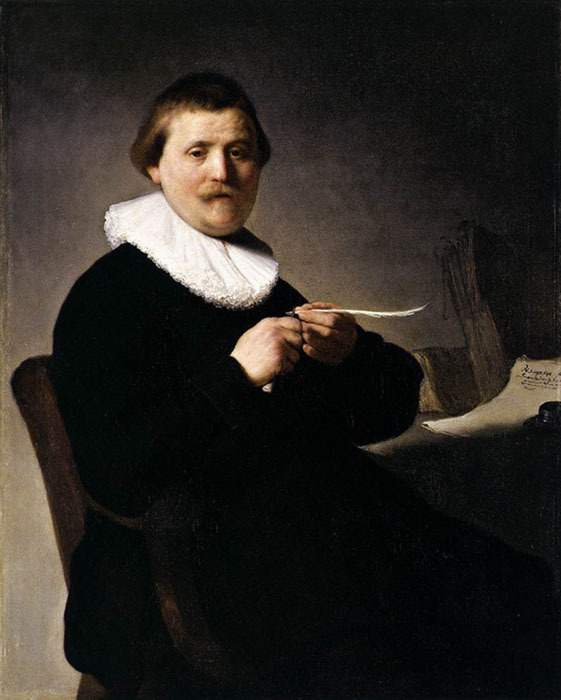 Conversely, Rembrandt was to bring characters from history into his late works - Aristotle, blind Homer, old Simeon - depicting them in such an individualized way that the pictures acquired the quality of an encounter between observer and subject such as is found in a portrait. In his late works, a differentiation between the depiction of an event and a portrait is no longer possible.